The underground test, which set off powerful seismic waves, drew immediate condemnation from Washington, the U.N. and others. PYONGYANG, North Korea — Defying U.N. warnings, North Korea on Tuesday conducted its third nuclear test in the remote, snowy northeast, taking a crucial step toward its goal of building a bomb small enough to be fitted on a missile capable of striking the United States. North Korea said the atomic test was merely its “first response” to what it called U.S. threats, and said it will continue with unspecified “second and third measures of greater intensity” if Washington maintains its hostility. The underground test, which set off powerful seismic waves, drew immediate condemnation from Washington, the U.N. and others. Even its only major ally, China, summoned the North’s ambassador for a dressing-down. President Barack Obama, who was scheduled to give a State of the Union address later Tuesday, said nuclear tests “do not make North Korea more secure.” Instead, North Korea has “increasingly isolated and impoverished its people through its ill-advised pursuit of weapons of mass destruction,” he said in a statement. North Korea claimed the device was smaller than in previous tests; Seoul said it likely produced a bigger explosion. The test was a defiant response to U.N. orders to shut down atomic activity or face more sanctions and international isolation. It will likely draw more sanctions from the United States and other countries at a time when North Korea is trying to rebuild its moribund economy and expand its engagement with the outside world. Several U.N. resolutions bar North Korea from conducting nuclear or missile tests because the U.N. Security Council considers Pyongyang a would-be proliferator of weapons of mass destruction and its nuclear testing a threat to international peace and stability. North Korea dismisses that as a double standard, and claims the right to build nuclear weapons as a defense against the United States, which has been seen as enemy No. 1 since the 1950-53 Korean War. The U.S. stations more than 28,000 troops in South Korea to protect its ally. Tuesday’s test is North Korea’s first since young leader Kim Jong Un took power of a country long estranged from the West. The test will likely be portrayed in North Korea as a strong move to defend the nation against foreign aggression, particularly from the U.S.
“The test was conducted in a safe and perfect way on a high level, with the use of a smaller and light A-bomb, unlike the previous ones, yet with great explosive power,” North Korea’s official Korean Central News Agency said, confirming speculation that seismic activity near Kilju around midday was a nuclear test. North Korea was punished by more U.N. sanctions after a December launch of a rocket that the U.N. and Washington called a cover for a banned missile test. Pyongyang said it was a peaceful, and successful, bid to send a satellite into space. The timing of the test is significant. It came hours before Obama’s speech and only days before the Saturday birthday of Kim Jong Un’s father, late leader Kim Jong Il, whose memory North Korean propaganda has repeatedly linked to the country’s nuclear ambitions. This year also marks the 60th anniversary of the signing of the armistice that ended the 1950-53 Korean War, and in late February South Korean President-elect Park Geun-hye will be inaugurated. 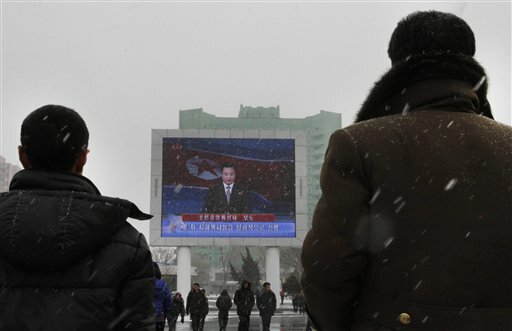 In Pyongyang, where it was snowing Tuesday, North Koreans gathered around televisions to watch a 3 p.m. TV broadcast announcing the nuclear test. The National Intelligence Service in Seoul told lawmakers that North Korea may conduct an additional nuclear test and test-launch a ballistic missile in response to U.N. talks about imposing more sanctions, according to the office of South Korean lawmaker Jung Chung-rae, who attended the private meeting. Analysts have also previously speculated that Pyongyang might conduct multiple tests, possibly of plutonium and uranium devices. North Korea is estimated to have enough weaponized plutonium for four to eight bombs, according to American nuclear scientist Siegfried Hecker. It wasn’t immediately clear to outside experts whether the device exploded Tuesday was small enough to fit on a missile, and whether it was fueled by plutonium or highly enriched uranium. A successful test would take North Korean scientists a step closer to building a nuclear warhead that can reach U.S. shores —seen as the ultimate goal of North Korea’s nuclear program. In 2006, and 2009, North Korea is believed to have tested devices made of plutonium. But in 2010, Pyongyang revealed a program to enrich uranium, which would give the country a second source of bomb-making materials — a worrying development for the U.S. and its allies. Uranium would be a worry because plutonium facilities are large and produce detectable radiation, making it easier for outsiders to find and monitor. However, uranium centrifuges can be hidden from satellites, drones and nuclear inspectors in caves, tunnels and other hard-to-reach places. Highly enriched uranium also is easier than plutonium to engineer into a weapon. Monitoring stations in South Korea detected an earthquake in the North with a magnitude of 4.9 and the South’s Defense Ministry said that corresponds to an estimated explosive yield of 6-7 kilotons. The yields of the North’s 2006 and 2009 tests were estimated at 1 kiloton and 2 to 6 kilotons, respectively, spokesman Kim Min-seok said. By comparison, U.S. nuclear bombs that flattened Nagasaki and Hiroshima during World War II were estimated at 13 kilotons and 22 kilotons, respectively, Kim said. The test is a product of North Korea’s military-first, or songun, policy, and shows Kim Jong Un is running the country much as his father did, said Daniel Pinkston of the International Crisis Group think tank. The decision to push ahead with a test will be a challenge to the U.N. Security Council, which recently punished Pyongyang for launching the December long-range rocket. In condemning that launch and imposing more sanctions on Pyongyang, the council had demanded a stop to future launches and ordered North Korea to respect a ban on nuclear activity — or face “significant action” by the U.N.
U.N. chief Ban Ki-moon condemned the test in a statement. The Security Council held an emergency meeting to discuss the nuclear test, and several ambassadors said they expected strong criticism. China expressed firm opposition to the test but called for a calm response by all sides. Chinese Foreign Minister Yang Jiechi summoned North Korea’s ambassador and delivered a “stern representation” and demanded that North Korea “swiftly return to the correct channel of dialogue and negotiation,” the ministry said in a statement. The other part of a credible North Korean nuclear deterrent is its missile program. While it has capable short and medium-range missiles, it has struggled in tests of technology for long-range missiles needed to carry bombs to the United States, although it did launch the satellite in December.